Sherlock Holmes: Man of mystery, or not? Sherlock Holmes is among the most famous Londoners of all time. Many tourists still see the bustling city through his adventures, and seek out his address, 221B Baker Street. It seems a logical deduction that the fictional detective's creator, Arthur Conan Doyle, must have known the city intimately. In fact, historian David Cannadine said Thursday, "Conan Doyle himself didn't spend that much time in London. When he wrote the early stories, he got the topography out of a street atlas." 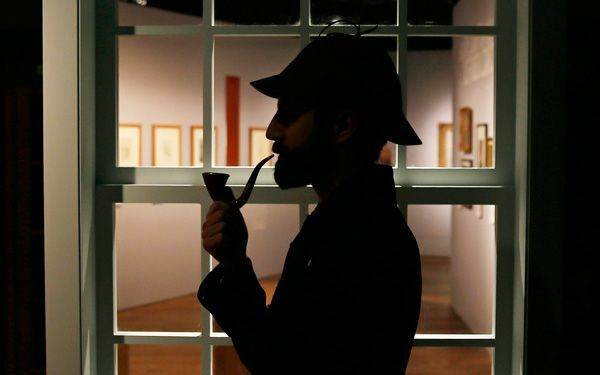 That is just one of the surprises provided by a myth-busting Museum of London exhibition that explores a character who has been endlessly adapted while retaining his essence: He's a cerebral sleuth, forensic scientist and archetypal Englishman. Through film clips, costumes, 19th-century forensic equipment and more, it follows Holmes from an idea in Conan Doyle's notebook at one point he was called Sherrinford Holmes to the smartphone-toting modern detective played by Benedict Cumberbatch in the BBC TV series "Sherlock." The exhibition also looks at the relationship between the detective and London. Holmes is an icon of the Victorian metropolis, a place of horse-drawn hansom cabs, dark corners, gaslight and fog. Fog gets a whole room of its own, lined with atmospheric images by American photographer Alvin Langdon Coburn and other artworks, including a painting of the River Thames by French Impressionist Claude Monet. Cannadine, who has contributed to a book that accompanies the museum exhibition, said Conan Doyle's stories give a sense of the city "the gas lamps and the clattering of horses and the fogs in Baker Street" that is vivid but in some ways misleading. "He doesn't write about the traffic jams, he doesn't write about the smell of horse-droppings, he doesn't write about the filth of the pavements," Cannadine said. "It's a much cozier image, in a way." For fans, the most exciting exhibit may be a yellowing notebook showing the moment Holmes was created. It bears notes for a detective story in Conan Doyle's handwriting. The author has crossed out his original title, "A Tangled Skein" and written "A Study in Scarlet" the name under which Holmes' first adventure was published in 1887. Conan Doyle, who died in 1930, probably didn't imagine that his creation would long outlive him. He tried to kill Holmes in 1893, sending him tumbling over the Reichenbach Falls while grappling with archenemy Moriarty. Readers were outraged, and the author resurrected the sleuth a decade later. The exhibition's lead curator, Alex Werner, said Holmes endures because he was strikingly modern. "This was a character who was using scientific methods to unmask the incredible complexity of the modern world," Werner said. "He's the only one who can do it. We would all like to be Sherlock Holmes." "Sherlock Holmes: The Man Who Never Lived and Will Never Die" is at the Museum of London from Friday until April 12. Critical thinking challenge: What does this mean: The Man Who Never Lived and Will Never Die. How can that be? Don't expect another winter like last one! I am in the middle of the collection of these stories. I think they are very interesting, and I enjoy trying to figure out who did what when. I think it is interesting to think about all the different ideas the author chose before deciding on something that made its way into the books. I think I would prefer the book over the movie series part because I always like the book version better, and part because I like the time period better. Sherlock Holmes is a detective who solves mysteries, yet the biggest mystery may be himself. You could call him extremely cunning, which is true, however he seems to be more of a "high functioning sociopath". Even though the setting for Sherlock Holmes may be sugar-coated to some extent, I think author Conan Doyle dose a great job of showing off Sherlock's slightly crazed and un-heroic side in his books. By saying he could never die is merely society's fault. Just as in 1893, when Doyle had him die originally, society brought him back. I do think that Sherlock Holmes was beyond his time a bit. The show "Sherlock" places him in a modern time that fits just too perfectly. In the end, though he never was alive, Sherlock Holmes will forever be alive in readers hearts. this statement is true because Sherlock Holmes was never a real person but he can never die because the will always be some sort of remake of the book, movies ,or TV shows. The quote "The man who never lived and will never die" is a great description of Sherlock Holmes because he is a ficional character, meaning he isnt real. But at the same time he is real because he is one of the greatest fictional characters of all time, which is why he will never die. "The Man Who Never Lived and Will Never Die" means that he was never born in the first place. Sherlock Holmes was an idea for a fictional person. So many people wanted Sherlock to stay so he also he never really dies. It's amazing, when I think of the first few thoughts of Sherlock Holmes, it's almost like I can be transported into the story. That is the beauty of writing, it allows people to travel places, and never leave the room. Authors are the world's best people to give freedoms to others. That's what I love about writing. Sherlock Holmes is a character with just a touch of irrationality, in the sense that he is able to do everything told in his adventures, but at the same time he is very believable. Honestly, I do prefer the older version, the new ones are no good to me. Sherlock Holmes although one of the most famous men to ever live in London, has hidden things about him. With a new museum "Sherlock Holmes: The Man Who Never Lived and Will never die" fans of the book are raising more eyebrows than ever wondering about the mind behind the book. The author of Sherlock Holmes, Connan Doyle, has actually been pushed into the shadows from is own character. Doyle dies in 1930 and It is now being said that he didn't even spend that much time in London and got his information from city atlas'. Connan Doyle created a brilliant character that has TV shows and museum exhibits in his honor. I love that a book can cause this much impact on people. It is very inspiring. 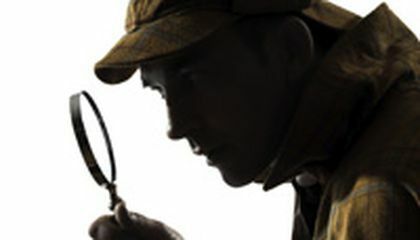 An exhibition will be at the Museum of London until April, focusing on the great detective, Sherlock Holmes. The exhibit is called "Sherlock Holmes: The Man Who Never Lived and Will Never Die" and focuses on the myths and facts surrounding the hallowed character and his creator, Sir Arthur Conan Doyle. Conan Doyle paints a much cozier picture of London for his readers, and he did not spend much time there. Also, Sherlock Holmes was at one point called Sherrinford Holmes. I liked this article because it gave me insight on the character I admire and read voraciously.